I had sudden craving for Soy Milk Custard/ Tau Fu Fa. So after church , I stopped by our favorite stall and bought back a tupper for dessert after a heavy lunch :) I preferred my own homemade one..somehow it taste much better but my injured arm needs rest and till then I should be happy and be contended with the bought one . 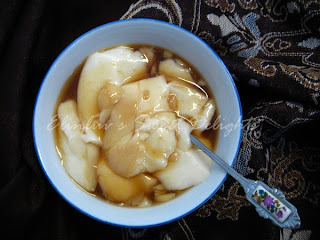 I like the one with the gula melaka syrup though the ginger sweet syrup is just as good. Different flavor all together but most important it satisfied my craving for now.